Last August, Minneapolis-based artist Emily Johnson started her piece SHORE on Clarion Alley in the Mission District, before leading the audience to ODC Theater. Some of the murals on the alley portrayed the narrative of neighborhood families and helped anchor SHORE, a piece about home, community and connections, into the local fabric of the city. This coming Saturday, as part of Mission Street Dances, Dance Brigade will perform an excerpt from Hemorrhage on Clarion Alley. The piece deals with the gentrification of the Mission and police brutality. Once again, the dance echoes themes of displacement and gentrification beautifully illustrated within the murals that cover the alley walls and just across the street from the Mission Police Station where the Frisco 5 went on hunger strike last month to protest recent fatal police shootings in San Francisco. I took this opportunity to reach out to Megan Wilson, director of Clarion Alley Mural Project (CAMP) to hear more about the history and projects of CAMP. Marie Tollon: What is your role at CAMP? Megan Wilson: My relationship to the project started in 1998 initially volunteering with the first block party. I did my first mural in 2000 and just continued to be involved. Aaron Noble, who was the last person to live in the warehouse at 47 Clarion Alley, had been pretty much the main administrator of the project since the beginning. When he was evicted and decided to move to Los Angeles, the project was turned over to me. I asked Aaron to stay on as a co-director because he had the institutional knowledge. I was co-director until 2005. We did the huge international exchange project with Indonesia during that time. I left in 2005, and I’ve been back since 2010 and heavily involved. MT: How do you select artists? MW: We are an all-volunteer organization and there are only two of us who manage the administrative duties of the project, myself and my partner Christopher Statton, working with an additional core group of about 10 – 15 volunteers. Being a 24-year project, we don’t have a lot of spaces that open up each year. We turn over a space when an artist is no longer here and has given it up, or if the space gets tagged really bad and the artist has moved or is no longer able to repair it or to paint a new mural. Or if it is a space where we’ve said: “this is temporary.” If the artists are taking good care of the murals, coming back and painting them, there’s no need to curate the wall to someone else. Most of the time we already know artists or organizations we want to work with, such as the Anti-Eviction Mapping Project, South of Market Community Action Network, Hospitality House, or the Arab Resource & Organizing Center. We do get proposals, and we accept some; however it’s only a few each year because we are so limited with space. MT: These murals are very much related to current issues in the neighborhood and the Bay Area. Yet CAMP also started a collaboration with Indonesian artists. How did that start and what did it entail? MW: I went to Indonesia in 2001 as one of the publishers and editors of the online art magazine Stretcher. I was interested in what contemporary Indonesian art looked like because I had never seen any. Indonesians were also coming off Suharto’s dictatorship so I was curious as to how artists were responding to that. After being in Bali for 2 weeks, I was recommended to go to Jogjakarta where the Institut Seni Indonesia (ISI), the most prestigious arts university for Indonesia, is located and I ended up meeting a great collective of artists – Apotik Komik. They were doing work that was similar to work that was being done in San Francisco at that time – quite ephemeral, working with cardboard, comic book influenced, pop culture influenced and politically influenced. I interviewed three of the members of Apotik Komik for an article for Stretcher. When I came back to the United States, I stayed in touch with them and wrote two articles for Stretcher based on my travels in Indonesia. One month later September 11th happened. Indonesia is the largest Muslim country in the world and at that time the country was still in the early stages of becoming a democratically run country, following a 33-years dictatorship with Suharto as President. We (Apotik Komik and I) thought 9/11 provided an opportunity to bring our cultures together to share our experiences with one another collectively following such a life-altering event for everyone throughout the world and that is what we did. It took 2 years to raise the money and in July/August 2003 six artists from here (Aaron Noble, Alicia McCarthy, Andrew Schoultz, Carolyn Castaño, Ryder, and myself) traveled to Indonesia for 5 weeks to paint murals, do an exhibition, and participate in many community discussions. Then Apotik Komik (Arie Dyanto, Arya Jalu, Nano Warsono, and Samuel Indratma) traveled from Indonesia to San Francisco for 8 weeks. It was an incredible experience to get to know these artists. We are launching another exchange with JokJakarta and this one is going to be more direct in its use of socio-political messaging to help support global change. We are living in a world that is driven by capitalism globally and that is destroying everybody and everything in its path. We need to work together on a global level to change the path that we’re on. MT: Can you talk more about how CAMP’s community partners are involved in the project? MW: We have key community partners like Community Thrift. They were the first building to give us space on the alley. They are also a wonderful non-profit and own their building. Since we lost our warehouse and then our garage, Community Thrift has let us store our ladders in their space, use their bathrooms and get water. We have been partnering with ATA since our early days and they often present video programming for our block parties. We also work with them on community organizing within the neighborhood. CAMP is part of the Plaza 16 Coalition. We also work specifically on murals with certain organizations like the Anti Eviction Mapping Project. MT: CAMP lost its warehouse then its garage. So where are you now? MW: We do not have a physical space, which is both a blessing and a curse. It is amazing how much we do with how little we have. Nobody gets paid. We don’t have overhead as far as a space we’d have to pay rent on. There is no danger of us getting evicted. We do have basic site agreements going back to the beginning of the project and now with the new developments that have gone up on the alley, we have contracts with those buildings that give us the rights to curate the space. MT: San Francisco has a strong history of muralism. 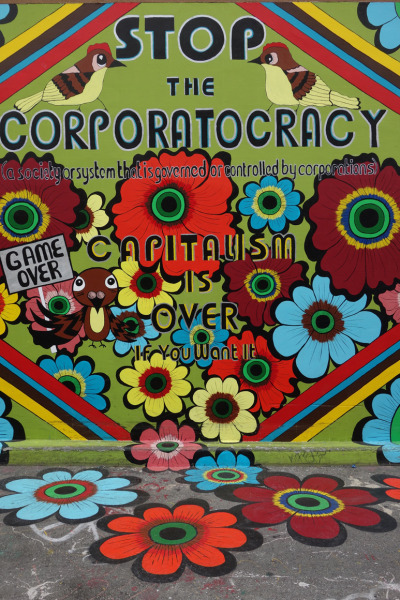 Can you talk more about it and how the murals on Clarion Alley fit within it? MW: I didn’t start as a muralist or as a painter, so I’m not that knowledgeable! I’m more of a conceptual-based artist who uses paint and murals because it’s a great way to get messages out. Balmy Alley, which started in the early ‘80s was the first mural alley that inspired Clarion to start 10 years later. Balmy focused on issues speaking to Central American socio-political issues and giving voices to that movement. There is also a labor activism mural movement in the Bay Area. Clarion brought it more toward the diversity of what you can do with public art, creating work that was more stylistically diverse – with spray and brush works, conceptual projects, and a many other approaches to creating public murals – also more diverse in the content presented. In the past several years socio-political messaging has become more predominant as we’re seeing so much hyper-gentrification impact the Bay Area. Like the trains with graffiti of the twenties and thirties that were going across the country carrying those messages, social media is carrying those messages everywhere now too. MT: Although hard to quantify, can you trace some of the impact of Clarion Alley on issues the murals are tackling? MW: Our mission supports giving voice to disenfranchised communities, to this neighborhood, and to the political issues that are happening in the Bay Area. As you said, it’s really hard to quantify but the images do get used a lot for socio-political imaging. They will get picked up and be used all over the world. In 2015, I was contacted by Dr. Albena Azmanova, an esteemed economist, an Associate Professor in Political and Social Thought at the University of Kent, and a policy advisor Associate Professor in Political and Social Thought, and policy advisor for the United Nations, the Council of Europe, the European Parliament, the European Commission, and Transparency International. 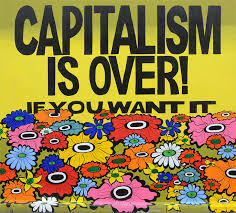 Dr. Azmanova is writing a paper for an international policy journal and she wrote to ask permission to use images of my murals “Tax The Rich”, “Capitalism Is Over! If You Want It”, and “Stop The Corporatocracy” to accompany her paper. These murals will be seen by policy leaders from around the world. Likewise, Rebecca Solnit recently wrote an article for the Guardian “Gentrification’s toll: ‘It’s you or the bottom line and sorry, it’s not you’ and she used an image of the Anti-Eviction Mapping Project’s mural “Narratives of Displacement.” So in this way, CAMP’s social/political messages have become a part of the visual landscape that is helping to define the social change movements of our time. Additionally, being on the alley painting, we have a lot of conversations with people, often tourists. People are so grateful that we are doing the work that we are and that they are seeing this type of work in the public realm. It is one of the only spots in the city that actually has that kind of voice and that kind of socio-political weight. MT: What are you working on now? MW: The website has been taking most of my creative energy for the last 5 months. Before that, Christopher and I were in Indonesia for 4 months and we each did large murals – Christopher, in collaboration with Nano Warsono, who was one of the artists that was part of the Sama-Sama/Together international exchange. Nano is also our partner in leading the next international exchange. I am itching to get back into making work! I know it’s going to be some socio-political messaging. It’s so hard to live in this climate and this world, and not respond. I miss making really beautiful, more personal, more design-based work. But at this point in time, I just can’t do that.